After teaming up with countless runway designers, celebrities like Brooke Shields, Kelly Osbourne and Rihanna, and even producing an entire line decked out in yellow and blue and devoted the Simpson’s (yes, the cartoon), MAC Cosmetics is a beauty brand leading the way in terms of creative yet completely wearable collaborative makeup collections. Each season we think we’ve seen it all until the latest announcement is made and surprise, we’re knocked off of feet with amazement and the sudden urge to add six more lipstick colors to the product gathering that lives at the bottom of most handbags. 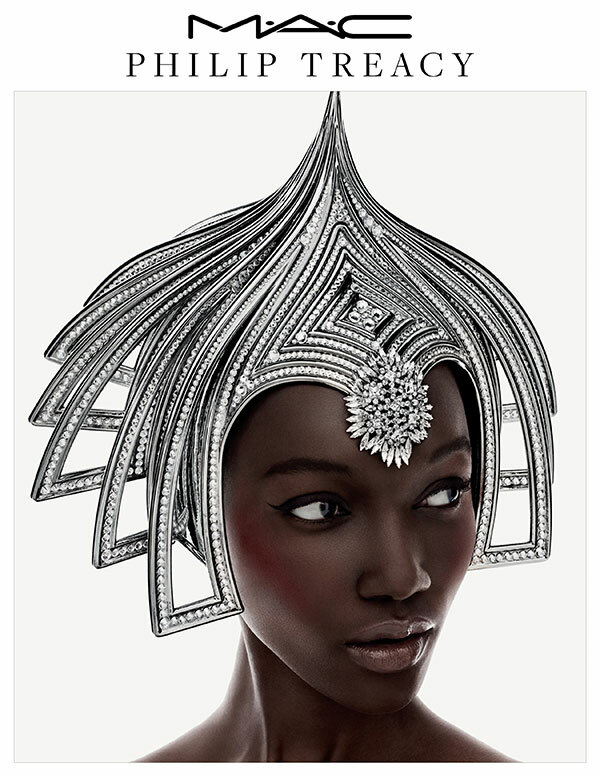 The latest move from MAC is a partnership with London-based couture hat designer, Philip Treacy. Inspired by his work, which has been featured in high fashion editorial spreads in publications like ‘Harper’s Bazaar’ and on celebrities like Lady Gaga, the artist teamed up with MAC to produce a collection of products that includes matte and satin-finished lipsticks in gorgeous hues, MAC’s signature Fluidline eyeliner gel in colors like teal and ink blue, and artsy highlighter compact that is touched with sparkly silver shimmer. You’ll also find cream-based shadow paint pots, mascara, and two makeup brushes. The line will become available at select MAC Cosmetics stores and online on April 2nd—only a few weeks away! Between the upcoming release of the Giambattista Valli and Julia Petit collections, this always-buzzed-about brand has a lot going on. What do you think about this new collaboration?